Lego has announced the Volvo Construction equipment of the future few weeks ago. I wasn’t really sure to enter the contest because I already have a WIP. (Un)fortunately, a Bricklink order delayed of 2 weeks provides me some spare time. So, let’s go. 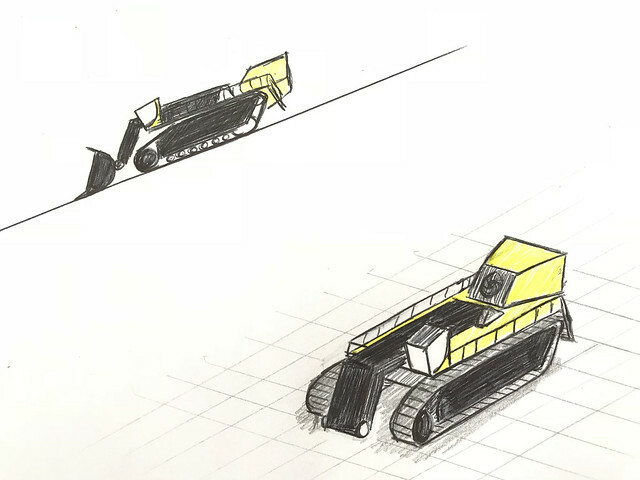 My first idea was to go on a earth moving equipment, such as an advanced dozer concept, but then moved to a loader. 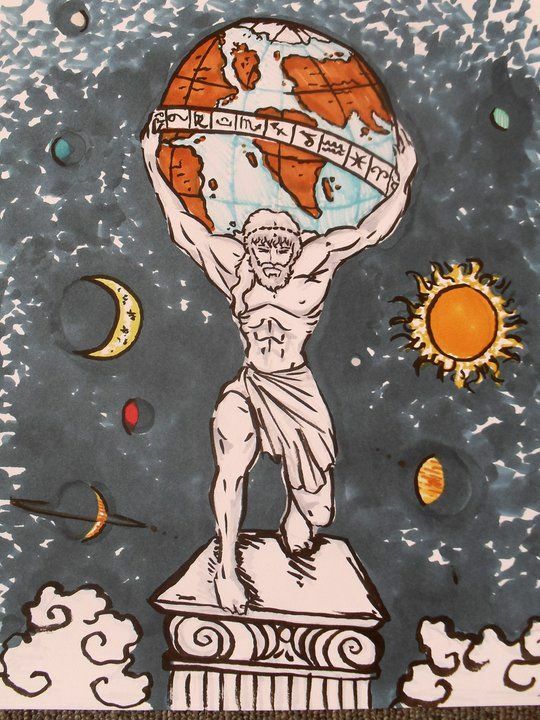 To name AtlaX is a combination of Atlas, the Titan whose hold the Earth on his shoulders in Greek mythology and the X used in Volvo concept name. 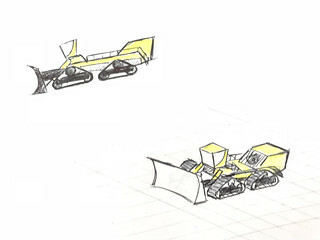 Design 1 was based on triangle-shaped tracks with two main arms –one above each track– and a centered cabin. First idea but wasn’t fan. Design 2: Except the engine compartment at the rear end there was no similarity with the previous design. The tracks have now a lower profile and there was only one main and central arm with a off-center cabin. 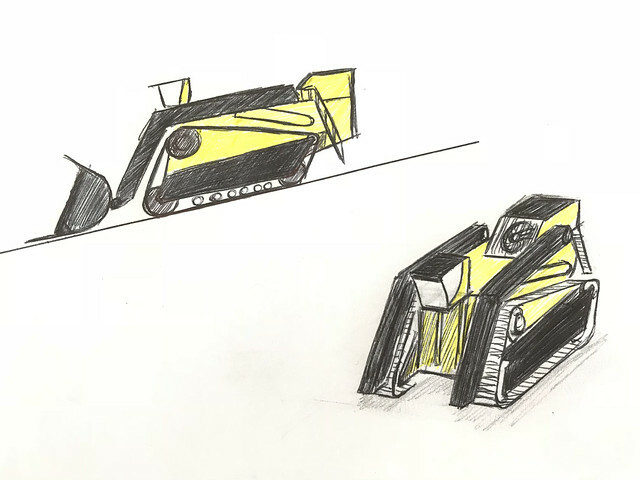 Design 3: Hey, the tracks have a low profile; nothing prevents to have a main arm mounted on a rotating superstructure, this would limit the need to skid-steer to offload in a truck. Final design: I’m not happy with this single big track on each side, this is ridiculous, let’s divide it in half. It makes two pendular small tracks so better suspension and ground contact. And all track modules will be the same to ease construction. 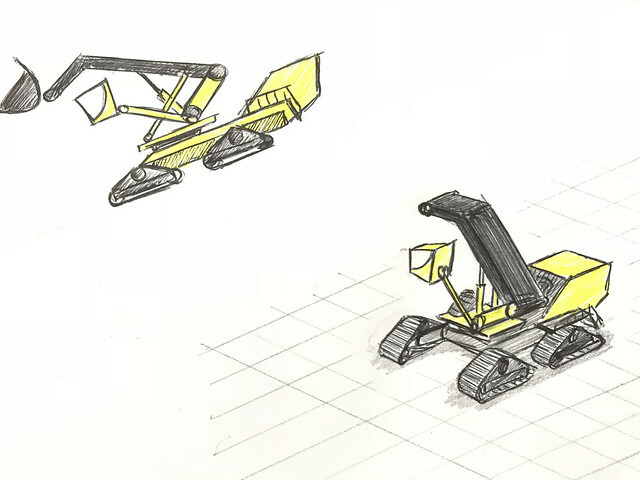 The AtlaX is a leap forward for the earth moving equipment. It can be described as a tracked high rise swing loader and can be adapted from the smallest to the biggest size. It is composed of two main parts: the chassis and the superstructure. The chassis with 4 tracks ensures a low pressure on ground as well as a high grip. On the rear end of the chassis is installed the engine compartment fitted with a modern thermal engine powering all the electrical and hydraulic function of the Atlax. For earth moving operation, the machine can also be connected to an electrical generator thank to the electrical cable installed on a dedicated drum. No consumption, no emission. In a perfect world, the chassis from the engine to the turntable is a standard part that can be used to build other vehicle. 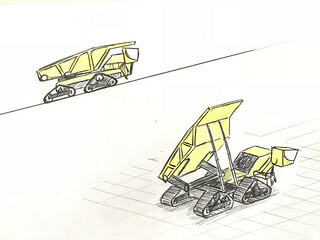 Example here below with a mining dumper equipped with a rotating tipper or a dozer. The superstructure, installed on a turntable can rotate on 360 degrees. It avoids the Atlax the need to skid-steer to offload the bucket. The main arm, supporting the bucket, is articulated to offer the best compromise between capacity and reaching a high height. The optional operator cabin is installed on the side of the main arm on a deployable structure to allow a great view in any circumstance. Thanks to a RC System, there is no physical link between the vehicle and the command, so the Atlax can be piloted either with an operator on board, on floor, or either have its cabin removed and be remotely controlled. The version built for the contest is the “big” one (mining version). 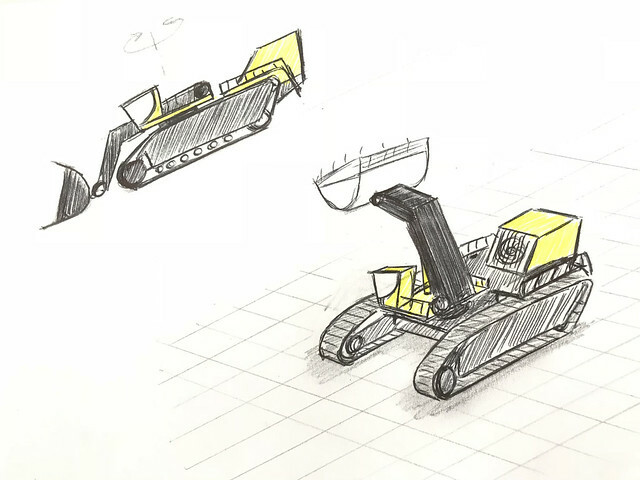 On a smaller scale (not larger than backhoe), it would be possible to install rubber tracks and have it RC controlled.